Rate this project Jean-Jacques Moulinier has announced the release of Toutou Linux 2014, an updated release of new version of the project's Puppy-based distribution designed French-speaking users. This is an update to version 5.5 "Wolx" released in November 2013. It is primarily designed for those users who preferred the simplicity and familiarity of the 4.x series of Toutou Linux. Compared to the 4.x series, several applications have been replaced, notably the SeaMonkey 2.21 browser which has become too heavy for a lightweight distribution (30 MB compressed and 51 MB when decompressed). It has been replaced by Opera 12.16 (14 MB compressed and 26 MB once decompressed). Otherwise this latest version continues to use the Openbox window manager with LXPanel as the default taskbar. Upgrades from previous versions are not supported. Visit the distribution's home page (in French) for more information about the new release. Download the live CD image from SourceForge: Toutou-Wolx.2014.iso (146MB, MD5). 2015-04-14 Distribution Release: Toutou Linux 6.0 "SlaXen RCX"
Toutou Linux is a lightweight operating system based on the Puppy distribution. Toutou is optimized for French speaking users and provides a friendly user interface based upon Openbox. The latest release of Toutou Linux, SlaXen 6.0 RCX, offers users Openbox 3.5.2 and a new side panel for quickly launching new applications. Though SlaXen 6.0 does not offer a default web browser, there are six different browsers available to the user at install time. SlaXen 6.0 ships with mtPaint, Foxit Reader, AbiWord and Gnumeric. Additional software can be acquired from available PET packages. Further information on this release can be found in the brief release announcement and the project's README file (both in French). Download (MD5) the new Toutou Linux live CD image from SourceForge: SlaXen-6.0_RCX_NoPAE.iso (186MB). Jean-Jacques Moulinier has announced the release of Toutou Linux 5.5, a major new version of the lightweight, Puppy-based distribution designed for older computers and optimised for French-speaking users. 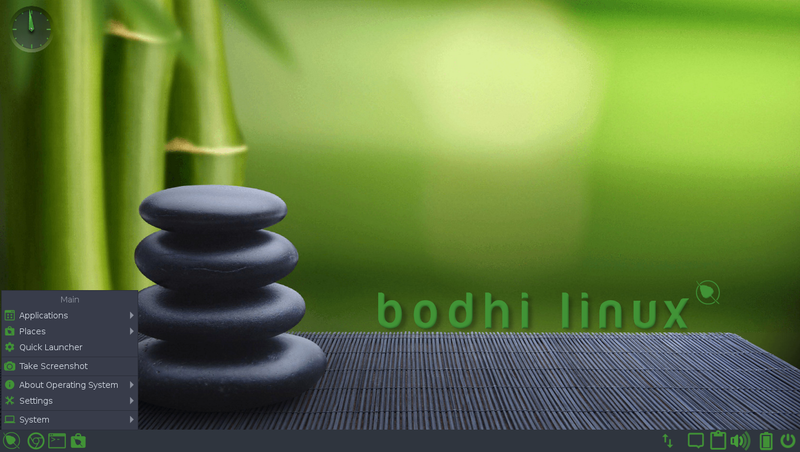 Code-named "Wolx", Toutou Linux 5.5 uses Openbox (rather than JWM in previous releases) as the preferred window manager, with the LXPanel taskbar and several customisation options. Also new in this release is OCI, a custom-built program that automates the installation of the distribution on systems dedicated entirely to Toutou Linux. A first-boot assistant is available for configuring various aspects of the desktop, such as keypad and keyboard options, menus, passwords and optional installation of printer and scanner drivers. The Flash browser plugin is not included, but a single-click install option is also provided in the first-boot assistant. Opera 12.16 is the default browser. Read the rest of the release announcement (in French) for further details. Download: Toutou-Wolx-5.5.iso (145MB, MD5). 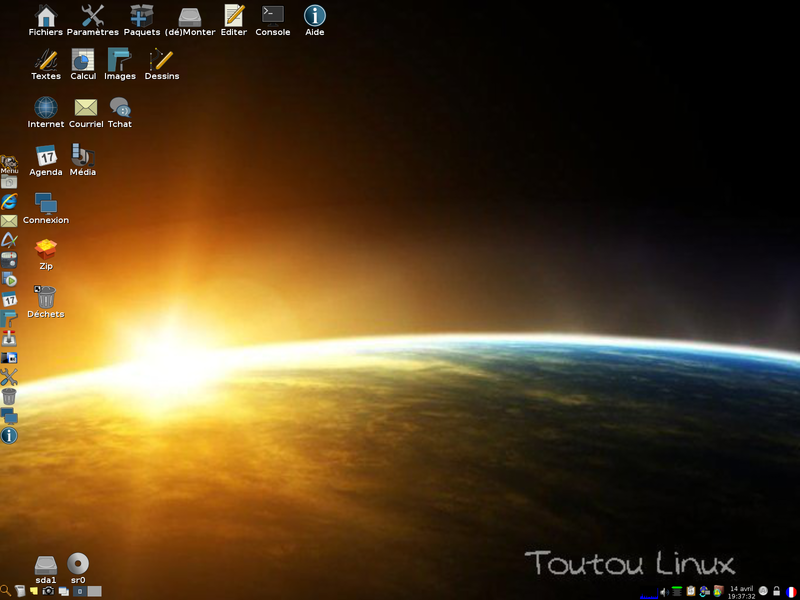 Toutou Linux is a variant of Puppy Linux designed for French-speaking users. The project's latest version of the fast, lightweight distribution is 4.3.1, released earlier today. Compared to Puppy Linux 4.3.1, the new Toutou comes with a new "golden" desktop theme, the network is set up automatically during boot (for wireless networks one only needs to set any security parameters), and there is a new menu grouping all the assistants and utilities. The distribution now has three separate menus listing programs, services and sessions - all of these are modifiable via a new menu manager. Other changes include user-friendly extensions to context menus, new tool for automatic loading of selected partitions, a tool for launching applications at start-up, and new functionality of the Pmount tool which can now mount partitions in either read-only mode or in read/write mode. There is more, please read the complete release notes (in French) for further details. 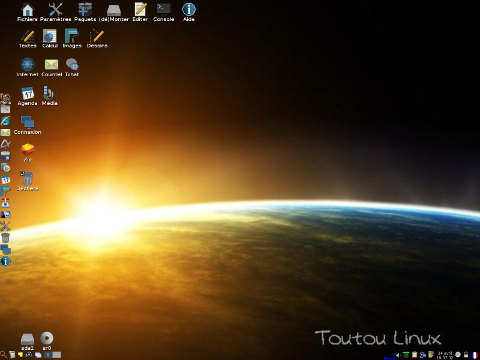 Download: ToutouLinux-431.iso (114MB, MD5).